A popular evening meditation practice. Includes loosening the body, dancing, witnessing and resting stages. Stressful living and unexpressed emotions can effect our ability to live joyfully and relate to others. Osho Active Meditations are scientifically designed to effectively release these tensions which block the natural flow of energies in our bodies, allowing us to become more peaceful and relaxed. Osho Kundalini is one of Osho's most popular and potent meditations techniques. It involves shaking, dancing, sitting silently and relaxing. 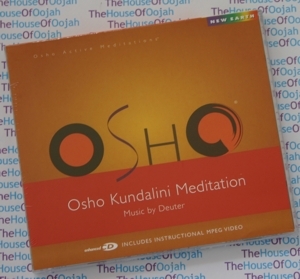 Osho Active Meditations combine all certain activities like shaking, dancing, jumping, humming and others to lead into silence and meditation. Music is used as a background for all these meditations. A final stage of 15 minutes of silence completes the meditations and a gong signals the end. A complete CD download includes also the silent stage. So one part of the download will have 0 MB and this is part of the experience. Dance...any way you feel, and let the whole body move as it wishes. Close your eyes and be still, sitting or standing...witnessing whatever is happening inside and out. Kundalini literally means coiled. In Indian yoga - an unconscious, instinctive or libidinal force or Shakti, lies coiled at the base of the spine. It is envisioned either as a goddess or else as a sleeping serpent hence a number of English renderings of the term such as 'serpent power'. The Kundalini resides in the sacrum bone in three and a half coils and has been described as a residual power of pure desire. The Yogatattva Upanishad mentions four kinds of yoga, of which laya-yoga involves Kundalini.Sri Ramana Maharshi maintained that the Kundalini energy is nothing but the natural energy of the Self, where Self is the universal consciousness present in every being, and that the individual mind of thoughts cloaks this natural energy from unadulterated expression. Advaita teaches that Self-realization, enlightenment, God-consciousness, nirvana and Kundalini awakening are all the same thing, and self-inquiry meditation is considered a very natural and simple means of reaching this goal. Yoga and Tantra propose that this energy can be "awakened" by Guru, but body and spirit must be prepared by yogic austerities such as pranayama, or breath control, physical exercises, visualization, and chanting.